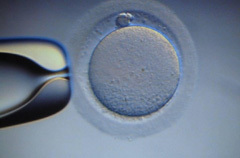 Evidence indicates that vitrification and warming of unfertilized oocytes followed by fertilization, commonly by intracytoplasmic sperm injection (ICSI), result in subsequent pregnancy rates which are acceptable and this technique should no longer be considered experimental. There is good evidence that fertilization and pregnancy rates are similar to IVF/ICSI with fresh oocytes when vitrified/warmed oocytes are used as part of IVF/ICSI for young women. Although data are limited, no increase in chromosomal abnormalities, birth defects, and developmental deficits has been reported in the offspring born from cryopreserved oocytes when compared with pregnancies from conventional IVF/ICSI and the general population. This document replaces the document last published in 2008 titled Ovarian Tissue and Oocyte Cryopreservation.